Printed from http://www.bodytalksystem.com//learn/news/article.cfm?id=847 on Apr 25, 2019. 2013 was a year full of connections. New Members and CBP's connected into the IBA membership matrix. Students physically connected with their local communities in IBA classrooms all around the world. For the first time in the history of IBA virtual students connected in the online classroom. We connected, danced, learnt, grew & loved in Malta- the birthplace of the BodyTalk System. We connected on the forums, in Newsletters and social media; sharing ideas, thoughts, well wishes and laughs. We connected at Earth Hour and tapped our cortices by candlelight. We connected each time we gave a session, received a session, introduced someone new to the system or caught up with an old or new friend within the BodyTalk matrix. These connections are collaborative, healthy changes that nourish and grow the IBA matrix. These connections are us all working together to bring BodyTalk, MindScape, BreakThrough and FreeFall to the world. 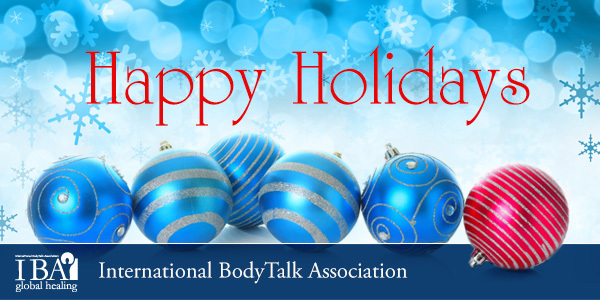 This will be our last Newsletter of the year and we wanted to take the time to thank you for your continued support in 2013; and to wish you a happy, healthy and safe holiday period with your family and friends. May 2014 nourish and inspire you.